Collection of Sarah Petite, Fredericton, New Brunswick. Beaver skull (netted), beaver fur, gull skull, gull wings, human hair, grosgrain ribbon, metal cage, feathers, fabric, beeswax. and bopping them on the heads! and bopping them on their heads! Foo-Foo is a wooly-eyed beaver skull with a beaver fur cap and feather antennas. He reminds me of a moth, and maybe he only comes out at night. 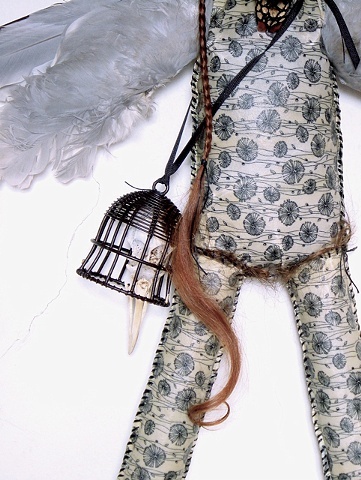 In his little cage is a seagull skull, so he must hunt gulls to steal their wings, for he has no arms of his own. His waxed body is completely stuffed with human hair.